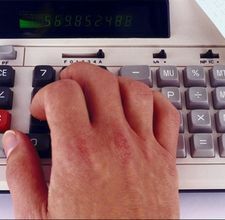 Ten key can refer to either the number pad on a keyboard to the right of the letters, or to adding machines or calculators. Acquiring skills in ten key is sometimes necessary to gain entry into certain fields where either a large amount of data entry, number listing, or accounting is acquired. Learning ten key is a little bit different than learning to type. For example, the home row contains the numbers 4,5,and 6, and is typed by the index finger, middle finger and ring finger respectively. The right hand is used, though there are left handed people who modify ten key for the left hand. There are also some keyboards with the ten key pad on the left side of the keyboard. Instead of measuring speed of ten key proficiency with words per minute (wpm) measurements as in typing, ten key is measured in either keys per minute (kpm) or strokes per minute. Most use the kpm designation when seeking employees and set a minimum kpm for applicants. Minimal proficiency in ten key is considered at least 140 kpm, though some companies which require only a little data entry might accept less.